There are many metal-forming processes which are well-established, such as deep drawing, which is used in the manufacture of billions of cans for consumable drinks. 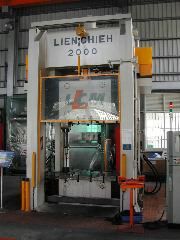 In press forming, flat sheets are formed between dies. The die set usually has a static face on which the sheet (blank) is secured and the mating die is depressed - this latter die is called the punch. 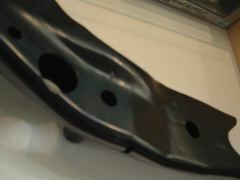 The major advantage of forming processes is that they avoid the waste of material as happens in machining. Productivity can also be very high compared with machining. The final properties of the metal in the formed state may also be superior to those in the blank. 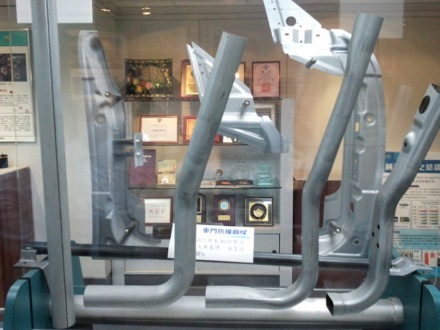 Hydroforming is a relatively new process, popularised by design studies which suggest that automobiles can be made much lighter by using hydroformed components made of steel. 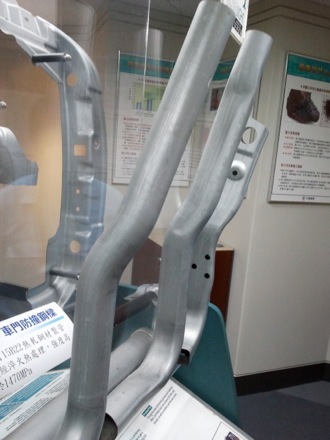 Structural strength and stiffness can be improved and the tooling costs reduced because several components can be consolidated into one hydroformed part. 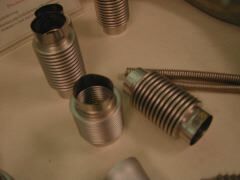 Components manufactured by forming can springback, meaning that the undergo elastic distortion on removing the component from the die. This effect is apparently smaller in hydroformed components. 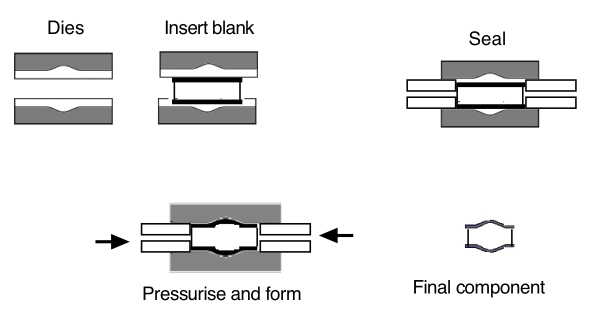 The process is quite simple - a blank with a closed-form, such as a cylinder, is internally pressurised using fluid. The fluid is frequently water. The applied pressure is usually in the range 80-450 MPa. 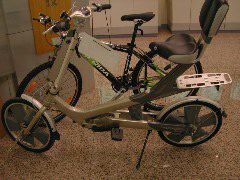 Its resultant plastic expansion is confined in a die of the desired shape. 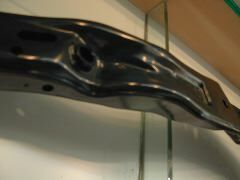 It is possible that some parts of the component thin excessively during hydroforming. 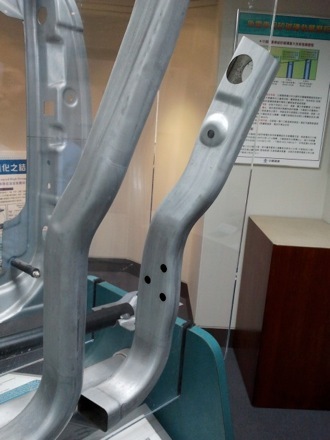 This can sometimes be rectified, in the case of tube hydroforming, by applying axial pressure to feed material into the bulges, thereby reducing bulging. Sheet metal can also be hydroformed but the sealing of the sheet to the die prior to pressurisation can be problematic, making the process too costly for mass production. One advantage is that large components with complex shapes can be made in one step, although the productivity tends to be small because the forming is slow and there is time involved in mounting and unmounting the blank from the hydroforming press. 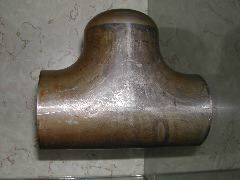 Starting shape cylindrical. Holes hydro-pierced. The components illustrated below all began as tubes before hydroforming. 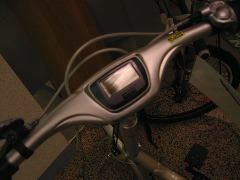 The 'T' junctions can be made without using any joining techniques, and the smooth profiles also help avoid stress concentrations. 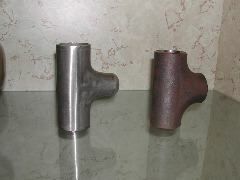 Hydroformed T-junction. The spherical cap at the end of the vertical tube is machined off. 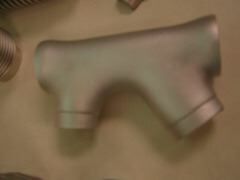 More hydroformed components, in each case beginning with a tube. The photographs above were taken at the Metal Industries Research and Development Corporation, Taiwan.